Bratislava lies on the beautiful blue Danube, arguably the most important river in central Europe. Blessed with majestic landscapes, medieval castles, storybook villages and one of the world’s most beautiful rivers, Slovakia is an exciting and accessible gem of central Europe. From the vibrant pulse of Bratislava to the romantic scenery of the Danube, this inviting country is superbly suited to outdoor exploration. Discover the age-old traditions and ever-changing landscapes of the Danube region on a unique bike & boat adventure, cycling along the famous river by day and cruising by night. 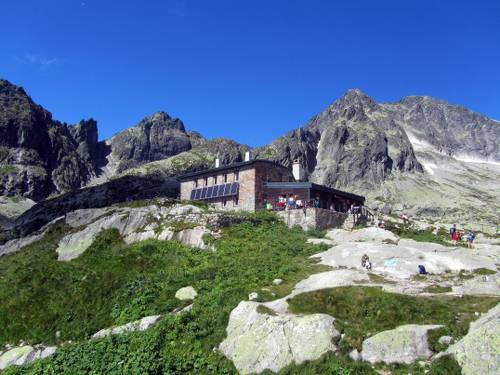 Or challenge yourself with an exhilarating hut-to-hut hike through the High Tatra mountains of northern Slovakia, a spectacular region known for its dramatic peaks, dolomite cliffs and alpine lakes fringed with lush forest. Our unique itineraries are tailored to bring you the highlights and hidden treasures of this beautiful country. Take a look at our central European adventures and discover beautiful Slovakia! Explore the capital city's lively metropolis with its fascinating old town, a European city yet to be touched by the mass commericalism. Europe's mighty river flows through Slovakia on its way to the Black Sea. Electricity in Slovakia is 230 Volts, at 50 hertz. The most common pin type is C. (2 round prong).